Paul and I were discussing Palin's wardrobe choices earlier today so it's only apropos I link this after I just encountered it via Brian Williams. Clothing is textual, indeed. And not only per the sartorialist. "The Republican National Committee spent about $150,000 on clothing, hair styling, makeup and other "campaign accessories" in September for the McCain campaign after Alaska Gov. Sarah Palin joined the ticket as his running mate. The McCain campaign now says the clothing will go to a "charitable purpose" after the campaign. The expenses include $75,062 spent at Neiman Marcus in Minneapolis and $41,850 in St. Louis in early September. The committee also reported spending $4,100 for makeup and hair consulting." The red leather jacket is, indeed, superb and it has gotten much air time. 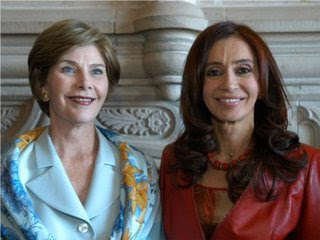 Btw, this is the picture I included in the entry from months ago about the Argentinian president de Kirchner. How is it possible to spend that much money on clothing and makeup in less than a year? What in the world did they buy? And in two shopping sprees? Wow, she should have a show like Sarah on the Fab Lane. Kimora, take a number! 150 thousand?! Hokey moms really spend that much on Gucci and Prada? 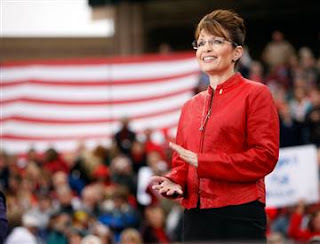 That's the funny thing: Palin could pretty much create the same hockey-mom-turned-VP-candidate look by shopping at Target. For much less. Someone needs to take away her Maverick Gold Card. This is way too funny!!! Red leather. Hm!